ASML's Architects is the first full history of ASML's bumpy road, from the early lithography research at Philips Research in the 60s to ASML's public offering in 1995. Pre-order now at a discount! How do you transform a hopeless research and business activity into a billion-dollar machine and a world-leading company? 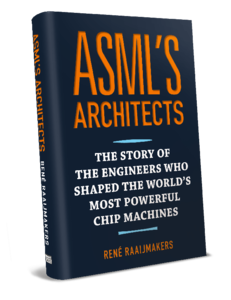 The Dutch enterprise ASML pulled it off, and the book ASML’s Architects by renowned technology writer René Raaijmakers reveals exactly how. ASML's Architects travels back to the origins, struggles, success factors and sheer luck of a company that was barely alive at the beginning of the 80s, yet managed to become the uncontested world leader in chip lithography. Today, ASML determines the pace at which all information technology advances. The book covers the technology and the business, but the real story is in the people behind them. Throughout its pages, the interviewed engineers, scientists and managers speak frankly about their struggles, their fights and the grueling teamwork behind the scenes. The professional English translation of this book is a work in progress. Once we receive the first 400 orders, we will finish translating ASML's Architects from the Dutch original, De architecten van ASML. The English version is an extended and exclusive print edition, and contains more historical pictures and illustrations than the original book. By ordering ASML's Architects in advance you receive a discount. You also help us to publish this English edition sooner. The first 600 buyers will also receive ASML's Architects two months before later buyers. Or read the full review by Mike Maynard from Napier. We will keep you up to date on the translation in our newsletter. You will receive the newsletter when you place your pre-order, or when you choose I only want to receive the free monthly update by email from the drop-down menu above. You can unsubscribe at any moment. Als oud (80) ondernemer en aandeelhouder van ASML en ASMI ben ik geïnteresseerd in de achtergrond en ontstaan van ASML. Als iemand met een elektrotechnische achtergrond heb ik enig idee waar over men praat. Ik heb het boek binnen een week bijna uitgelezen.Het is een boeiend verhaal,goed geschreven, met korte hoofdstukken die steeds weer uitnodigen om nog maar een hoofdstuk te lezen. Elke ASML-aandeelhouder zou het moeten lezen. The book Architects of ASML is very well written and gives useful insights how to innovate and maybe even more how not to. Thanks for writing this excellent book René Raaijmakers. ASML has become great by keeping thinking great under all circumstances. Other companies would probably not have survived all the economical and technical challenges. It makes me personally proud that ASML is a Dutch company. We have been kindly given some early proofs of the book to take a look at, and were hugely impressed by the honest storytelling, readable style and comprehensive research. Journalists tend to be a rather cynical bunch, yet it was clear that Rene was surprised by the rise and rise of ASML. A Dutch company, launched at the time when Philips was seen as the jewel in the Netherland’s technology crown, decided to take on companies like Canon and Nikon that dominated the industry and could bring incredible resources to compete with startups like ASML. Despite being a long read, the book is incredibly entertaining, and we’d strongly recommend it as a Christmas present: not just to geeks, but anyone who is interested in technology and loves a good story.